Blazing Saddles teases its finale, breaking the fourth wall a number of times between the rampant racist epitaphs and gloriously stupid townsfolk. Heady… that’s Hedley Lamarr (Harvey Korman) looks right at the audience from his desk and asks why he’s talking to them. 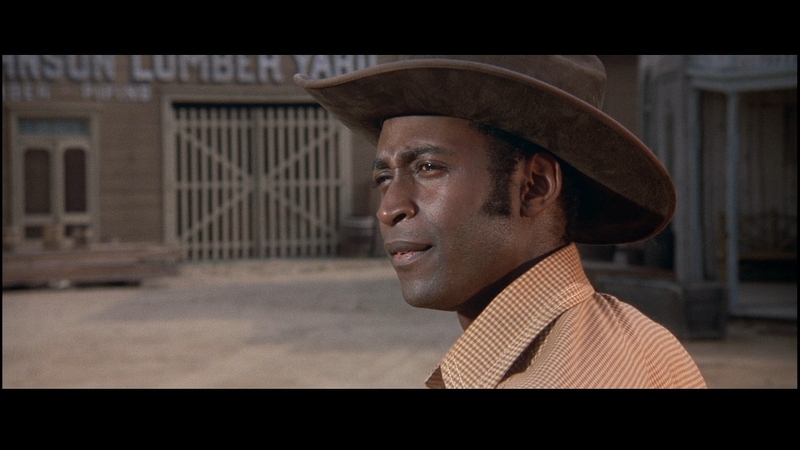 Bart (Cleavon Little) does it too, signaling the introduction of the drunken Waco Kid (Gene Wilder). It has to set this up, because how else can you explain a movie that is too widely scaled for its own good, breaking out of the Warner Bros. set confines and taking the streets. People on the corner waiting to cross look on baffled as hundreds of extras, fresh from the great pie fight, pour from the entrance to end up… somewhere. It’s so chaotic, such an absolute moment of maniacal comic genius, it’s hard to even catch that the fake town, Rock Ridge, has suddenly turned into the real Rock Ridge, but we all know that it’s the fake Rock Ridge (?). There’s a point to be made in all of this, and it’s not just to parody one of the greats of Hollywood genres, but show the idiocy of racism and all its forms. 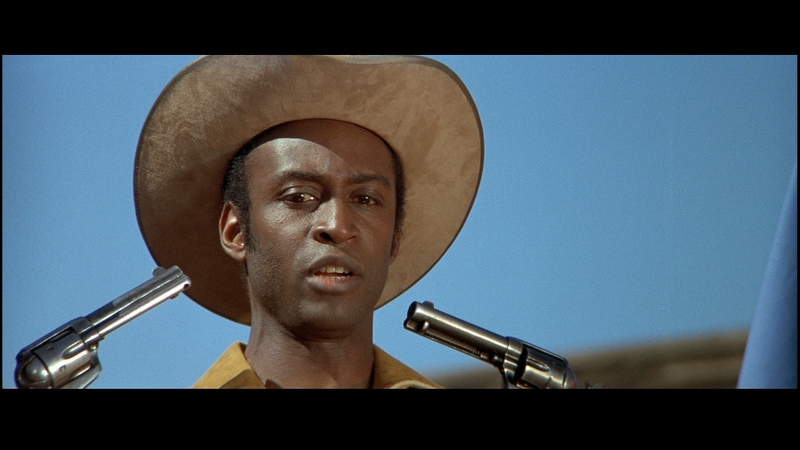 Blazing Saddles carries a plotline that is devilishly simple, but constructed as such to make the overbearing racism seem not only proper, but hysterical. Cleavon Little took the lead role from Richard Pryor, and while there’s little doubt the movie would remain the classic that it is with the replacement, Little is smooth, sly, and unyielding to a town that wants him dead. They’re simple folk, people of the land, you know… morons. Their desperate cries for a sheriff are met with the arrival of Little, not quite what they were looking for, if only in terms of color. Not only does Little need to fight back against the ever increasing odds as a high-ranking official tries everything to buy up the land Little now protects, he must earn the trust of every Johnson in the town, which is everybody actually. Blazing Saddles isn’t offensive, at least if you’re smart enough to look past the wealth of slurs pushed towards every race. It’s a film of intolerance, human nature, and stampeding cattle, even if that’s through the Vatican. This is the smartest film Mel Brooks’ ever directed, not only for its ingenious layer of parody, but how it proves everyone can come together in a time of crisis to build a toll booth. Warner is always keen with their classics, Saddles no exception. A VC-1 encode is sufficient, if producing an image with a slightly murky quality during some of the more complex shots. As Little enters Rock Ridge for the first time, the band shows some slight deterioration of video quality, their uniforms murky and under detailed in comparison to objects elsewhere. Print damage is kept to an absolute minimum, the minuscule specs and scratches hardly worth getting worked up over. The codec handles a light, minimalistic film grain typically without fault, a few minor spikes that seem to be caused by splicing in a generational print still resolved well. Stock footage during the wagon train becomes more apparent too, not only for the elevated film grain, but the general softness too. That’s somewhat of a positive, showing what an outstanding piece of restoration work this is. Detail is wonderful, from crisp facial definition to the minute details of the period costumes. The opening railroad and subsequent quicksand rescue are loaded with fantastically resolved rocks and sand. Text on wanted posters is clear, and sharpness is consistent. Colors are vivid, that above mentioned band wearing bright orange uniforms that are stretched to the point of bleeding. One more tick on the color and they would have. Flesh tones are rich but natural, never overbearing. Primaries remain bold, a dress worn by Madeline Kahn late a looker purely for its bright pink saturation. Black levels are not as rich as they probably could be, hidden slightly by the nicely calibrated contrast and color. The infamous campfire scene is a bit of proof that they don’t hold up quite as well as everything else, in the end a minor distraction from the work done elsewhere. A paltry Dolby Digital 5.1 mix is included along with the mono (the same specs as the HD DVD). The 5.1 affair introduces some spacing, effective too. The opening theme belted out by Frankie Laine is fantastic in its fullness, lyrics sharply centered while the music spreads into the stereo channels. A slight bit of surround bleed is just that: slight. The effects like the whip cracking are better off in the stereo channels anyway. Action is merely there, left alone to its own devices. There’s no bass to speak of, the low-end typically muddled, the dynamite in the church severely muffled. The ending brawl is strained, constant screaming and acts of such cruelty stuck in the fronts, with the center carrying most of the load. The only time this mix escapes the mid is when Little arrives at the Jazz band in the middle of the desert (! ), instruments distinct and clear if not in the best of shape. Extras carry over from the DVD and HD DVD versions of the film, like everything else on this disc. Mel Brooks gives us a commentary track which turns into more of an interview. He’ll spout off some facts that even die-hard followers may not know, but it only lasts for an hour. Next are some deleted and alternate scenes, showcasing 10-minutes of edited-in-for-TV sequences, which are used to pad the running time due to the amount of cuts when networks air the film. Next up is a decent documentary entitled Back in the Saddle, interviewing some of the surviving cast members. It runs close to 30-minutes. The focus is mostly on Brooks and the writers, but Gene Wilder and Harvey Korman get some time as well. The documentary is padded with nearly all of the deleted scenes mentioned above and some of the comments are redundant after you listen to the commentary, but it’s great to see some of the stars of this classic today. Madeline Kahn gets a short segment from the show Intimate Portrait that runs four minutes as it talks a bit about her classic performance. Warner includes the TV pilot of Black Bart, a proposed spin-off from the film after its success. Starring a young Louis Gossett Jr. as Bart, it featured various little known actors trying to replicate the characters from the film. Without the ability to let it all out due to the standards of TV, this is 25 minutes best spent elsewhere. Still, credit must be given for not only including this oddity but finding it in remarkable condition.